I have spent an entire week dressing up the little yurt pouch I showed you last week. The pouch was made using a plied reeled silk which is about the same girth as a #3 crochet thread. Although the bands and accessories I added this week are small, I was now working with 60/2 silk and progress is never fast for me doing pick-up with those tiny threads. Sometimes, just the inclusion of a third color can make all the difference. You will see that all the key fob examples, except the brown and tan one in the upper right hand corner, use at least three colors in the pebble section. I like to tell weaving friends not to be in too much of a hurry to move onto bigger, more complex patterns. There are simple variations that can be applied to even the most basic patterns that can make them more interesting…as simple as dividing the pattern to add an extra band of color, for example. Use your energy and concentration to work on some other new challenge such as using finer thread or going wider while sticking with a pick-up pattern with which you are already familiar. It was fun meeting Brian when I was at Vavstuga recently. He showed me that he still has one of those key fobs that you see above. He had bought it from me back in 2010 attached to the card with information about my newly-released e-book. 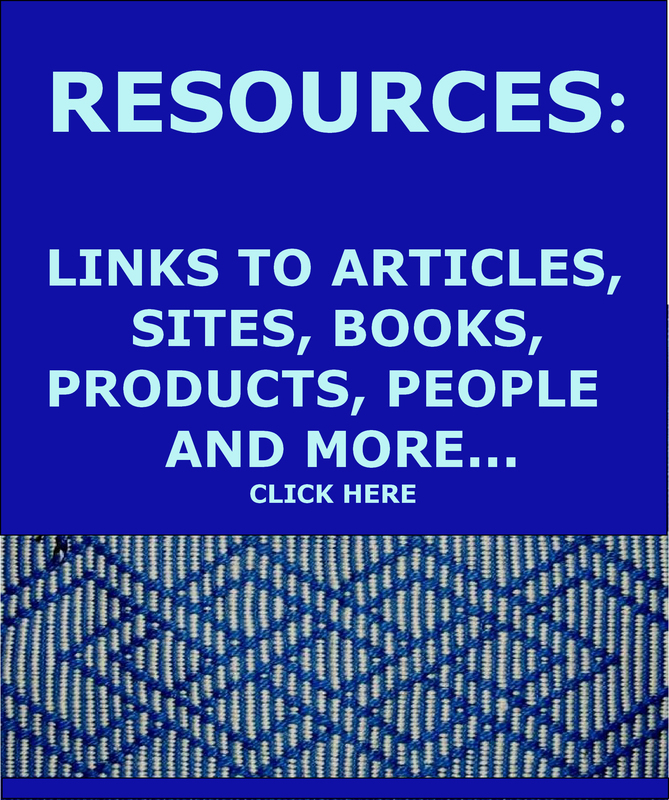 That was back in the days when the book was available on the WeaveZine site. Here he is among the looms in the Vavstuga studio, where he showed me the fob, taking a break from weaving to play his dulcimer accompanied by owner, Becky Ashenden, on fiddle. What a treat! I wove the pattern for the yurt pouch and accessories using the Andean Pebble Weave structure. Because the 60/2 silk threads were so fine and were difficult to lift and separate with sweaty hands and fingers, I added an extra set of heddles for the light threads and created a temporary picking cross for each pick. This meant that I could scoop up groups of light threads using a pointed stick and not have to use my fingers to pick and drop each one. It also meant that I had to do away with my beloved Saver Cord but, as my pattern only had 16 threads, it was not a big deal. People who have been weaving using my two books will know what I am talking about when I mention Saver Cords and picking crosses. 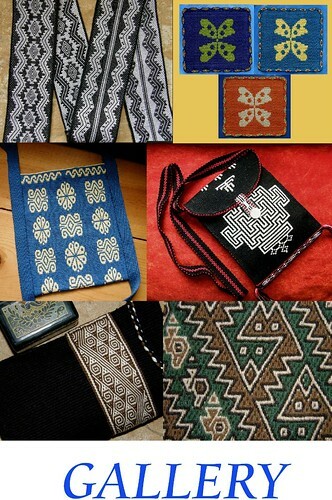 Above, you can see the ”naked”version and now dressed-up version of the yurt-shaped pouch with some accessories, all bearing the same ”hooky” pattern. I intend cutting about a third off the tassels.I am letting them just sit for a while until I am completely convinced of the need to do that. Once they are cut, there’s no going back. I had intended weaving a matching ribbon to sew to a black top. I did weave the ribbon, which you can see on the right, but didn’t like the way it looked against the top and abandoned that idea. So, now it is a necklace. I made a wrist cuff as well. I had examples of other cuffs and necklaces (the ones you see below) that I had woven in the same 60/2 silk to use as width guides. That way, I knew how many ends to wind and was able to get the width correct right from the start. That is always a big help. I love how I can start my weaving on my backstrap loom with a selvedge and, therefore, not have to bother with hemming that edge later. The lower edge of the cuff you see above is the selvedge. The upper edge is folded and hemmed. Two hems would create extra bulk at the place where the two ends of the cuff overlap to join. I’ll be able to use the nice clear plastic snaps that Susan sent me to connect the cuff as well as the necklace. I was able to use the left over warp ends from the cuff project to make the tassels. It is nice when nothing gets wasted! Some left over pieces of the ribbon were used to make tabs through which the braided strap was threaded. Last of all, I wove and sewed a plain-weave tubular band to cover the seam at the base. I dithered a bit with this part as I wasn’t sure how it would look. Would it be too big and bulky? I used 16 ends of a #10 crochet cotton and I think it was perfect match size-wise if not exactly color-wise. I love tubular bands. They make such nice finishes and I have to stop myself from adding them to everything. Now I want to place a circle of felt at the base on the inside of the bag to cover the cut edge of the silk fabric circle. The fabric has been stabilized with Fray Check but does not look very attractive. If I had more sewing skills, I would have lined the pouch…maybe one day I will reach that skill level. One of the weavers in the Ravelry group commented on the pattern I used to decorate all these pieces. 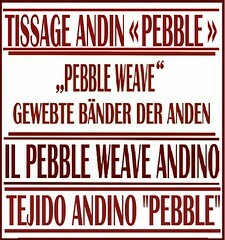 It appears in my first book, Andean Pebble Weave, as a simple double hook pattern (at left) but you are excused if you don’t recognize that straight away. There are many things that can be done with the basic double hook shape. A weaver could simply repeat it along the length of a band leaving a small space between each motif. To make things more interesting, perhaps the motif could be flipped back and forth along the length of the band so that one motif looks somewhat like a letter S and the next its mirror image. Jill, with whom I wove recently, played around with this same motif. Rather than flip the hook motifs or leave blank spaces between them, she connected them with a completely different little figure. I love her original idea. Quite a different look and fun to weave. A long time ago I had wound a warp to weave a series of ‘S’ motifs in the simple warp-float structure that I had found on a Central Asian yurt band. I made a mistake in the warping and ended up with twice the required number of warp ends. So, I simply wove the ‘S’ pattern as a mirror image of itself in two columns. I loved the way it came out and it has become one of my favorite items… a belt that I always wear when I am traveling. Many online acquaintances have recognized that belt around my waist before they have looked up and recognized me! So, that is basically what I did with the double hook motif in the Andean Pebble Weave structure that I used on the yurt-shaped pouch. I wove two columns of the motif flipping it back and forth as I went. It really is very easy and creates a complex-looking pattern from elements that are ever so simple. You tend to look at the pattern as a whole and fail to recognize its individual components. Above, you can see the green band, which has the double hook motif flipped this way and that, lined up alongside its mirror image. Take away the green borders between, and you have the motif that I used on the yurt pouch. Weaving an even more simple motif, which is symmetric both horizontally and vertically (like the one below left), in several columns can often create beautiful patterns. If you want to work with more warp ends and create larger patterns, simply take a motif that you already know well and multiply it. Who knows where it will take you! Multiply it, flip it, connect it with other shapes, add additional bands of color…have fun with it. Use symmetry and repetition to your advantage. Focus on the white hook shapes on the bands with the light blue border and then see how those same shapes have been aligned on the center band to create a completely different look. Compare the white hook shapes in outer bands with the yellow ones n the center and see how different the end result is. Here’s a pattern that I created purely by mistake. When I arrived back in Chile after my first experience learning to weave in Peru in 1996, I warped up to weave the classic ”meandering river” or ”linquito” pattern, as my teacher Maxima calls it.. Without realizing it, I had set up my pebble sheds the wrong way round. I continued to follow the instructions for the pick-up that I had scribbled down while working with my teachers. I had no understanding whatsoever of the structure at this early stage and was just following steps. Imagine my surprise and confusion when I ended up creating something completely different, yet really very pretty! That’s the pattern that you can see in the picture above…the one on the right. I haven’t come up with any kind of interesting name for it and just call it the ”mistake pattern”. Both this and the pattern I was actually trying to create are in my first book. You can see examples on the left where I have woven it as a mirror image of itself in two columns leaving space between to fill with other small motifs. Filling in spaces like that can be the first fun steps to creating your own unique patterns. One of my weaving friends in California made the same kind of mistake. She was having trouble with a piece and showed me the motif that she swore she was following in my first book. My book…really? I didn’t recognize the pattern at all! But, by bending my eyes and brain a bit, I realized that, while she had been doing the pick-up perfectly, she had her pebble sheds out of order. She had created her own pattern in the process. Sometimes I think that I should weave all the patterns in my books that way and see what happens! Speaking of flipping….flip the krokbragd patterns, pictured above, 90 degrees. 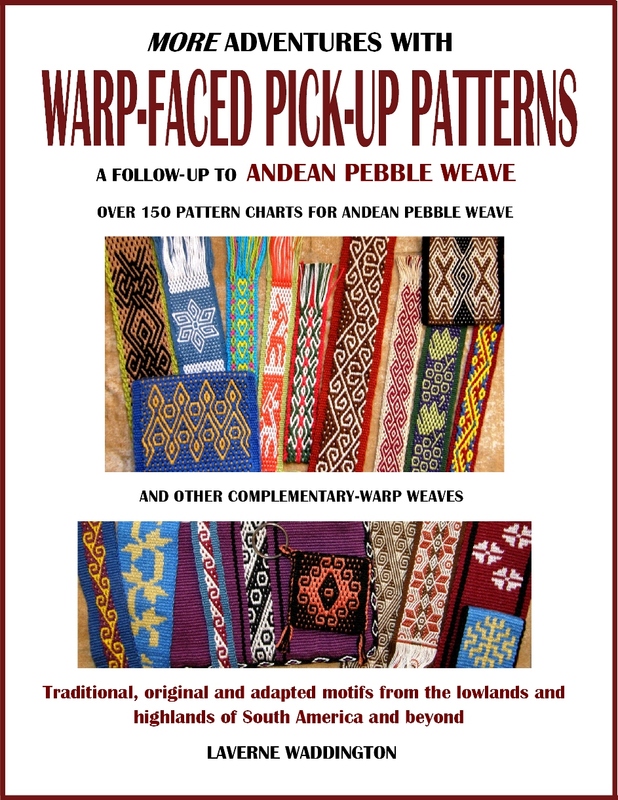 They are weft-faced but if you flip them, you could well believe that you are looking at warp-faced patterns woven in the warp-substitution technique. These are wall hangings in the bedrooms at Vavstuga woven by Becky. I think I will weave some of these. I wove some similar shapes in the warp-substitution technique when I was studying Bedouin patterns. Some of these krokbragd pieces have the ”horse tooth” motif that appears on many Bedouin textiles. 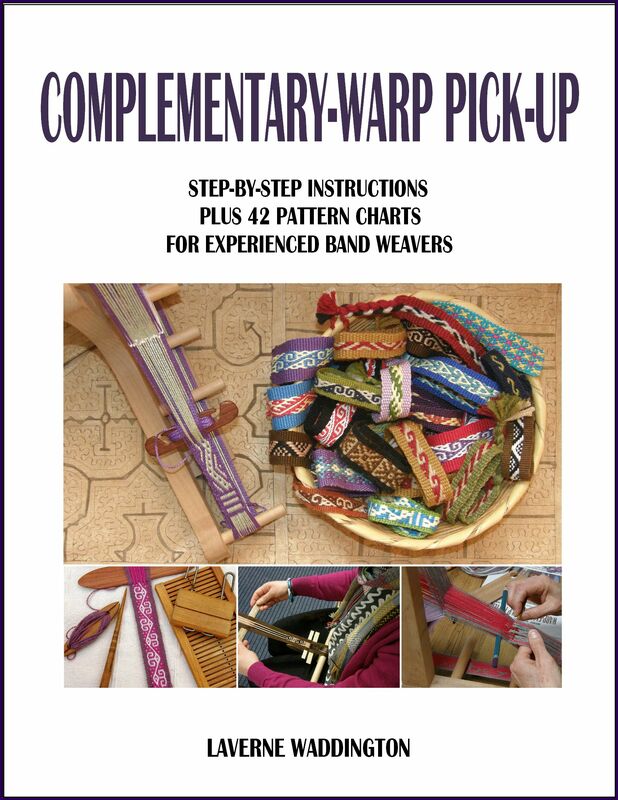 If you can tolerate the long warp floats on the back, the warp substitution technique allows you to use more than two colors along any part of the pattern. We did, however, find by looking at some Omani textiles, a cool and simple way to tie down those floats. I blogged about that some time ago. I’ll refresh you on that when I get down to weaving these designs. Hi Laverne, Loving this post! I had a thought for a name, or at least something to play with for your “mistake” pattern. It makes me think of frogs crouched and ready to spring. Maybe that image will give you some thoughts as to a name? I hope you are doing well! we had our first weaving group meeting last week, Judy and Rose both came, as well as a new woman who is a seasoned weaver but has not done much with backstrap. I plan for us to meet again in February. Off to work on my nieces blanket. . .
Hi Lori. So pleased to know that you guys are getting together to weave. Please say hi to them for me. Thanks for the name idea! Color, color, color! Simplicity repeated into complexity. The possibilities for design just go on and on. Fun! The colors in your fabulous yurty pouch are seen in your final photo of Autumn in New England. All the additions to your pouch are perfect, especially the tiny tabs on the strap. As`always, thanks for your support, Julia. I know that you are always soaking up inspiration and your projects are so original and exciting. As usual, Laverne, all your work is perfect! The colors and the added embellishments make each piece special. Making wrist bands from the leftovers is a stellar idea. I wonder if you could also use those bendable metal bands and make a reversible band that can be used on any size wrist. Vavstuga is a wonderful treat for weavers. I was amazed, and still thin about the many warps wound onto back beams that were laying, waiting to be woven. Your enthusiasm and dedication to the craft is inspiring. Thank you so much. Yes, the stay at Vavstuga was heavenly….so many beautiful textiles, expertise, yarn and enthusiasm. I’ll look into the metal bands you mention.